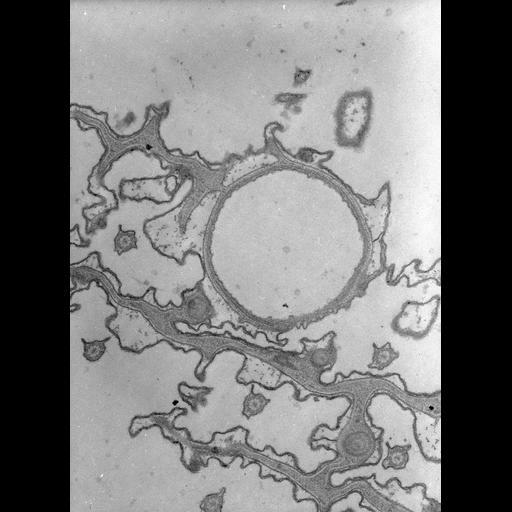 A circular depression on the dorsal surface of the cell marks the expulsion site of a contractile vacuole. This is referred to as the contractile vacuole “pore.". Microtubules encircle the pore. Trichocyst tips are pushed to one side by this large opening. Cacodylate buffered fixative. TEM taken on 9/27/68 by R. Allen with Philips 300 operating at 60kV. Neg. 16,000X. Standard glutaraldehyde fixation followed by osmium tetroxide, dehydrated in alcohol and embedded in an epoxy resin. Microtome sections prepared at approximately 75nm thickness.The raw negative was scanned with an Epson Perfection V750 Pro and this high resolution image is best used for quantitative analysis. Additional information available at (http://www5.pbrc.hawaii.edu/allen/).